Despite all the negative reviews I'd read of The Casual Vacancy, I couldn't help approaching it with a sense of expectation. The opportunity to sink into a brand new world created by Rowling? Delicious. And then I came back to Earth. This first 'adult' novel of Rowling's is as gritty and real as the first few Harry Potter books were magical and colourful. 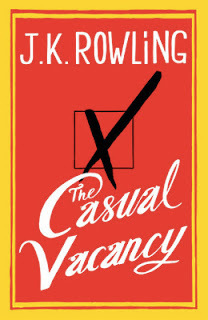 The casual vacancy that the title refers to is a seat on the Parish Council of the village of Pagford. The vacancy (created by the death of Councillor Barry Fairbrother), and the election that follows it, is the excuse that Rowling uses to dive head-first into Pagford and its politics. The election soon turns into a vote on what Pagford is going to do about the Fields, a council housing estate on its edges. The middle-class citizens of Pagford think that the Fields are corrupting their areas and their kids, and want to remove it from Pagford's limits. The book's greatest strength is its cast of memorable characters. Pagford's citizens - from its obese delicatessen owner to its schizophrenic school principal, from its Indian origin GP to its resident wife-beater - are all unique. And alongside and underneath the political currents flowing among Pagford's adult citizens, there is also the world of Pagford's adolescents. Surprisingly, their world turns out to be even darker than the adults' world. If this book deserves to be remembered for something, it is for Krystal Weedon, the Fields-bred daughter of a drug addict and off-and-on prostitute. Not many readers will be able to dislodge Krystal Weedon from their minds very easily - her bravery, her devil-may-care attitude, her poignant attempt at love, and the many tragedies of her life. Unfortunately, the characters are very poor compensation for the things that are wrong with this book. First, Rowling's political inclinations show through too well. Somebody should tell Rowling that all her donations to charity (she was the first person to go off the billionaire list because of her 'charitable' nature) already make her political sympathies very clear. We don't require a five-hundred page garishly-covered book to tell us. And secondly - the writing! Dear God. I can't believe I used to find her a good writer. I admit I haven't re-read Harry Potter in a long time, but I don't remember the writing being this bad. One of the basic rules of writing is that you keep the point-of-view the same throughout at least a particular passage or scene. But Rowling jumps around with her POV so much that the reader gets quite confused. One minute, we're listening to the thoughts of Colin the schizophrenic principal. And the next, we're on to his long-suffering wife. Of course, rules are meant to be broken, especially in the art of writing. But in this book, the rule-breaking doesn't quite work. The only occasion it makes sense is when all of Pagford is attending Barry Fairbrother's funeral. The narrative jumps among the many people in the church, giving us their perspectives and thoughts and preoccupations. Overall, the book is - clumsy. If I had to come up with a metaphor for this book, I would say it's a slice of bread with jam smeared on with too heavy a hand. The jam is tasty enough in itself, but too much of it makes the taste-buds revolt.